Shri Sanjay Mitra, Defence Secretary, Ministry of Defence, Govt. 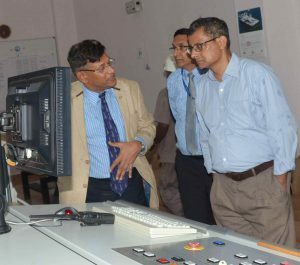 Of India visited GSL on 12TH July 2017. During the visit, Defence Secretary was briefed by RAdm Shekhar Mital, NM, IN (Retd), CMD GSL on progress of ongoing projects for Sri Lanka Navy and Indian Coast Guard under construction at GSL. Secretary Defence was conducted around the shipyard and also taken to both the Sri Lankan Patrol Vessel as well as ICGS SHAURYA. 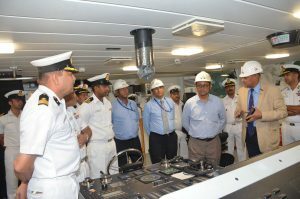 Commanding Officer Shaurya DIG DS Chauhan conducted him around the ship and apprised Defence Secretary of the advanced features of CGOPV with reference to older OPVs. Defence Secretary took keen interest in ongoing construction of ships, R&D, innovation & 3D design being done by shipyard. CMD highlighted that shipyard has delivered all project on time in last 3 years and is also ready for delivery of SLOPV prestigious export project on 22 Jul 2017 almost 3 months ahead of schedule. It is noteworthy that the Shipyard is executing large export orders from Myanmar, Sri Lanka and Mauritius. Today GSL is the largest exporter of ships from country with present order book of over Rs 1200 Cr.